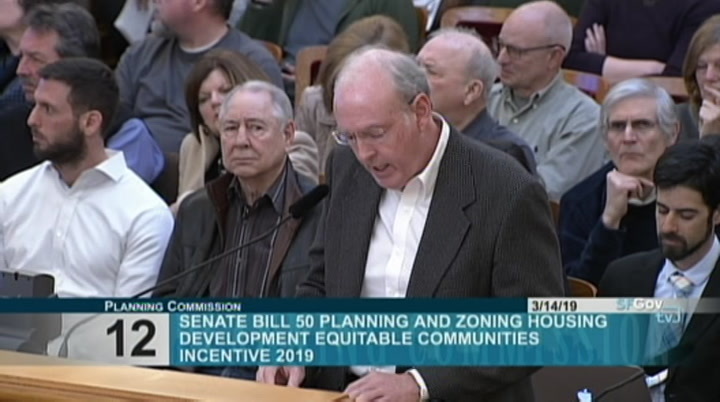 unanimously, 5-0. if we could continue item 5b, indefinitely. >> so continued. commissioners that place us on the consent calendar. all matters are considered to be routine by the planning commission and may be acted upon by a single roll call vote of the commission. 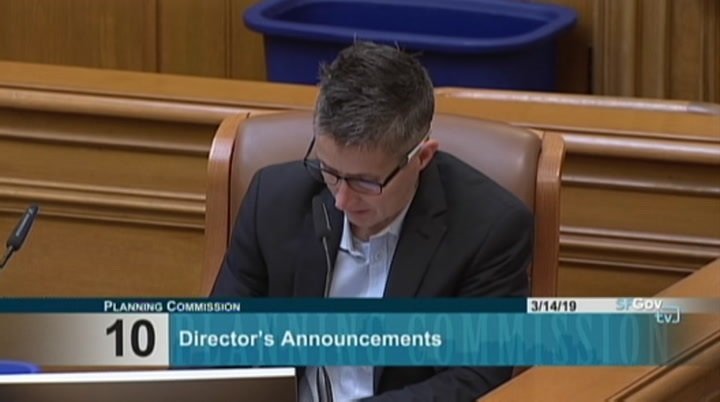 there will be no separate discussion of these items unless a member of the commission, the public or the staff requests. in which event it shall be removed interest the consent calendar. item 6, 906 broadway and 2498 lombard street. conditional use authorization. i have a number of speaker cards for item 6. so we will pull that off consent. and shall we hear that at the beginning of the calendar? >> president melgar: yes, the beginning of the calendar. >> very good. >> want to wait for staff for item 6 or move on? >> president melgar: i think we need to move on. 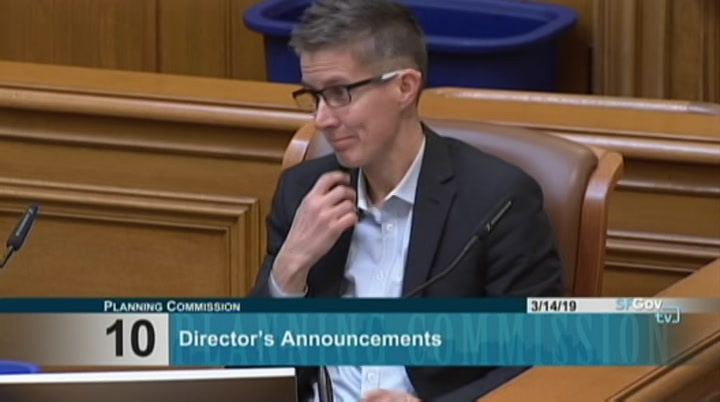 i'm sorry for folks that are waiting for item 6. we're going to take the next item which is item 12. 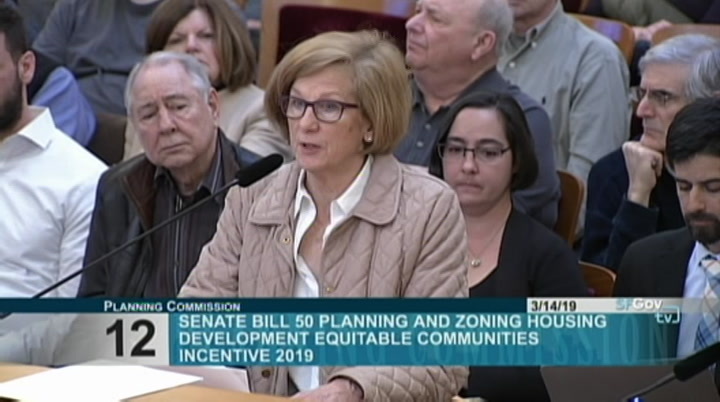 >> senate bill 50 planning and zoning housing development, equitable communities incentive 2019. information presentation. 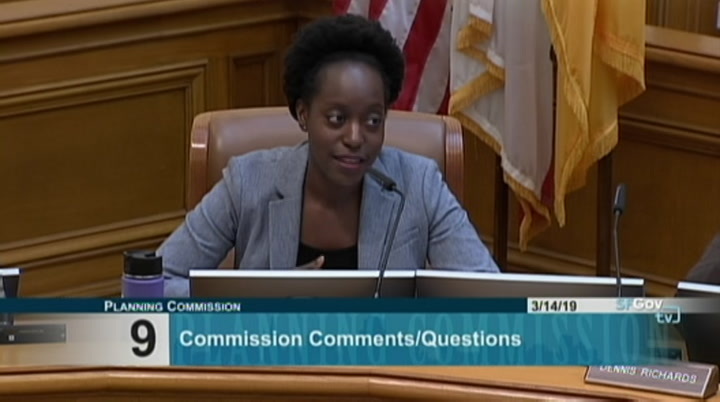 >> we have a new staff member that is not new to us, but it's her first hearing before you today. her name is alison ricci, she is staff architect and urban designer for us. she draws on global insight, problem solving to address the challenges in her work. her recent project is the indian basin and the shipyard d for d.
notably, she was recognized by the aia with a national award last year as the young architect for her significant contributions to the profession. prior to joining the planning department she was an associate at skid more and merrill and earned a masters degree from m.i.t. she holds a masters from tulane and post graduate diploma in urban design from oxford brooks university. she is a registered architect and a key member of the department design team. 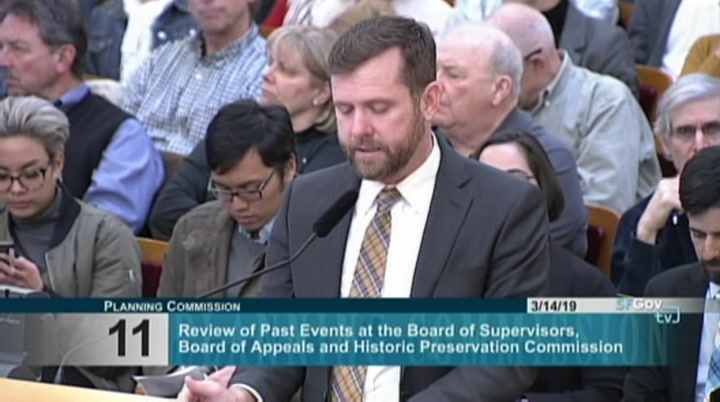 as we move into the staff presentation, i just wanted to note kind of the rarity of the commissioner's request to review the state legislation. this is not something we do often. 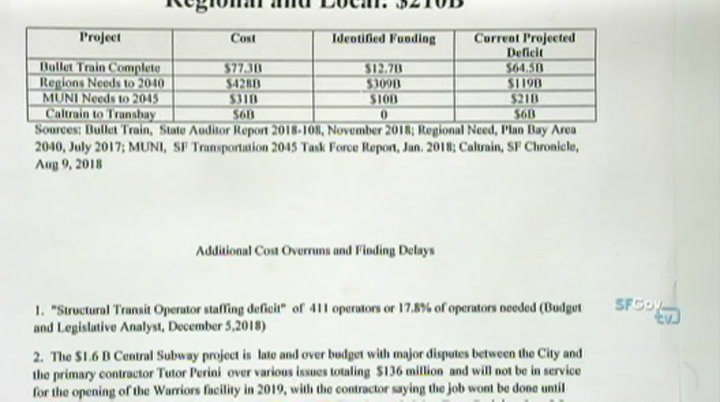 the only other time it happened was last year 827. and in such, for the public's understanding, there are difficulties as we try to understand what local impacts would be from state legislation. 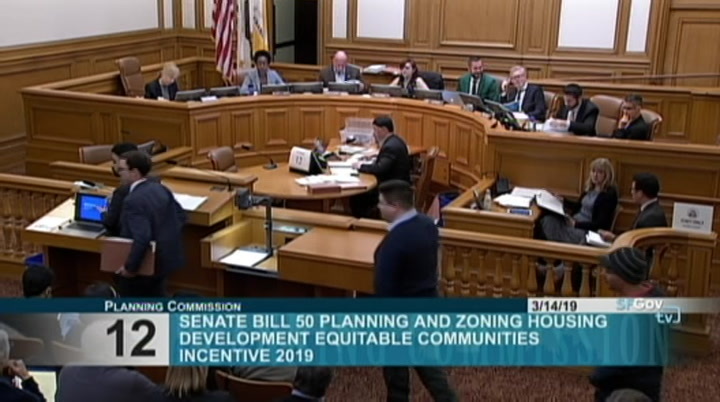 these bills are not written specifically to apply to san francisco, but instead are trying to address the conditions across hundreds of cities. 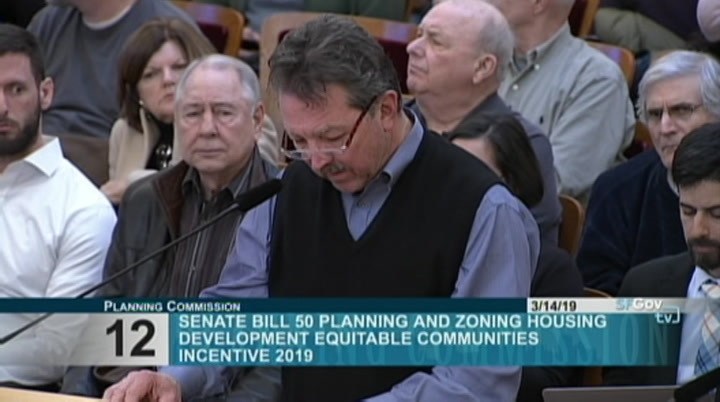 and that means for local planning and trying to figure out how it interacts with our ordinances, it can be complicated. 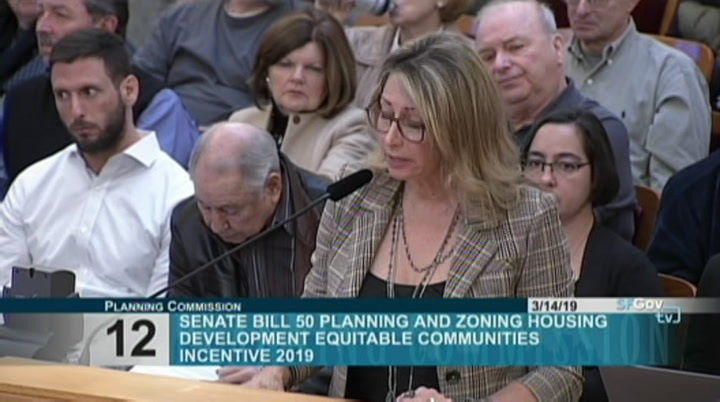 here locally, we have the zoning administrator to help us interpret the local bills, but for state bills, interpreting this authority is given to the state attorney general and they won't offer clarity until after the bill is enacted. for that reason, it's important to know there is a good deal of uncertainty in our presentation and we try to let you know about that. it's appropriate for us to be uncertain at this time. the bill can still change as it moves through the process and we expect it will continue to change. 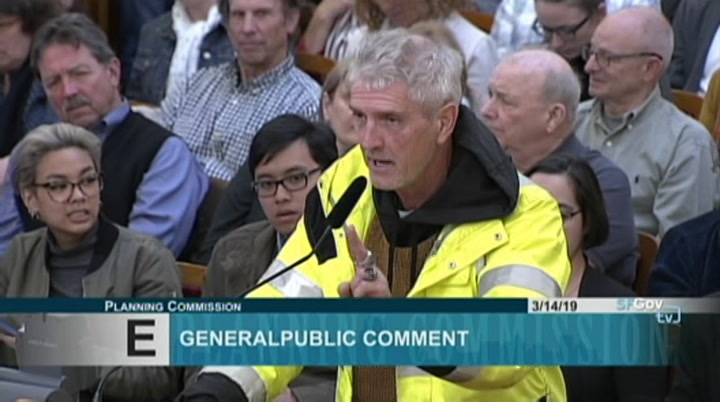 i'd be happy to tell you about the process after the hearing, too. 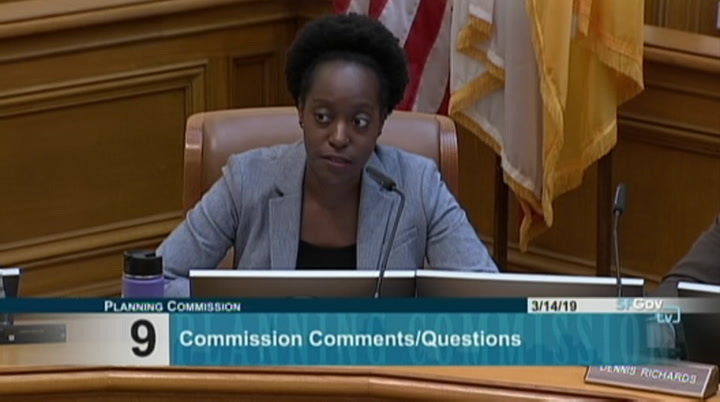 with that in mind, i just wanted to let you know that staff is going to share with the commission our understanding of the bill as drafted today. your seat until this item concludes. so, we can't proceed until those persons who cannot find a seat in this room, unfortunately, must leave the room. and you can make your way down to the north light court where, again, you can watch and listen to these proceedings. your name will be called. i'm announce item 13 being next and you can then reenter the room. thank you very much. effects it could have. 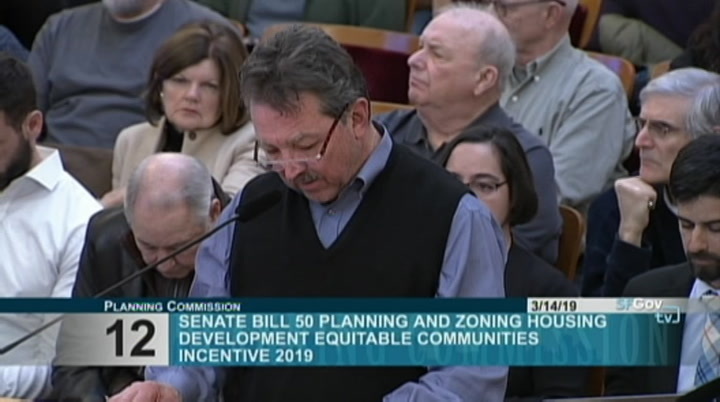 i think emery said, this analysis is sort of our best guess as what could potentially happen if the bill were to pass. it's likely there will be further amendments to the bill and announcements will evolve as that happens. the power point on the screen. 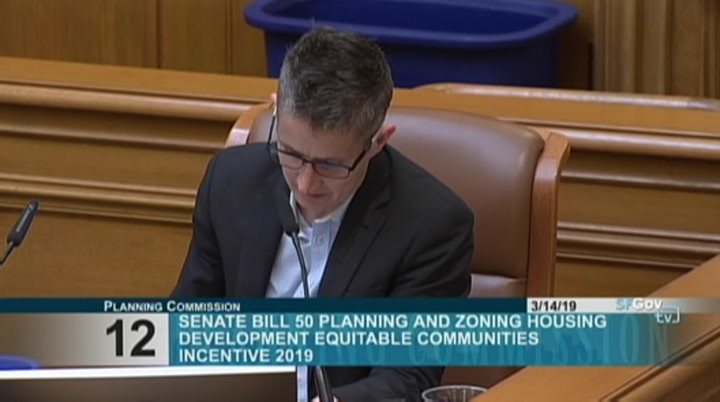 so senate bill 50, was introduced by senator scott wiener in december of last year and amended in the senate just a couple of days ago. the memo we prepared was before it came out. 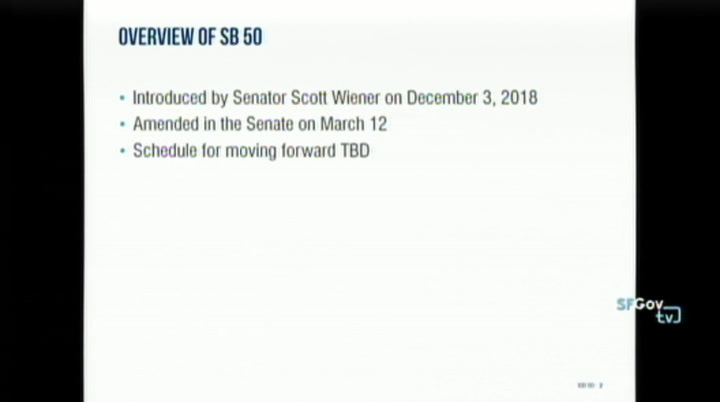 we have printed summaries released by the senator's office here. we anticipate the bill will be amended further and heard in committee in the senate in the next month or so. 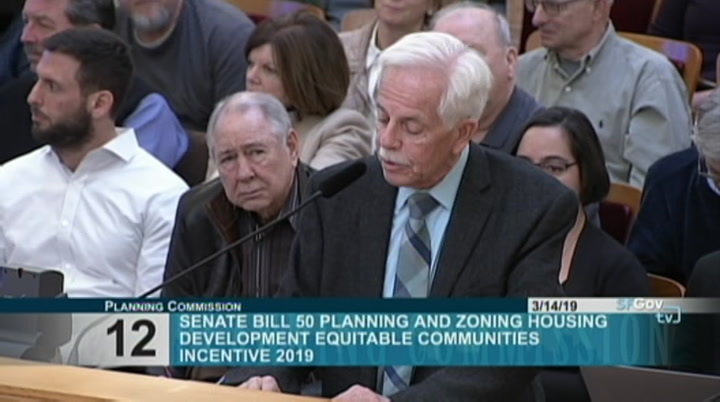 so in many ways, sb50 is similar to 827. like 827, it's to increase the amount of housing built near transit stations and stops. required to meet a minimum requirement. the recent amendments seem to indicate that projects in san francisco would likely be required to comply with our inclusionary ordinance to qualify for a bonus. 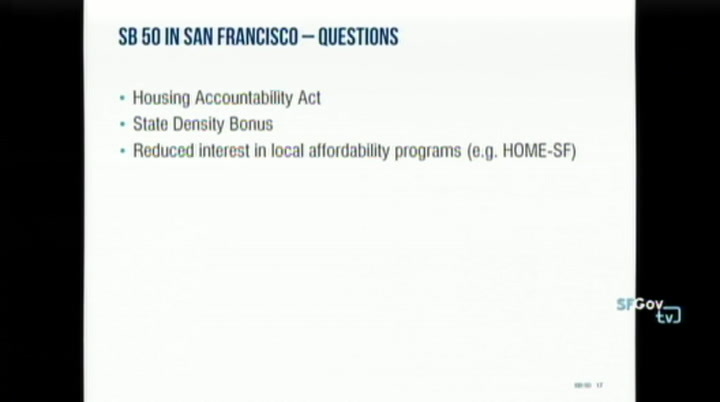 the legislation allows what is called -- so the bonus is called equitable communities incentive. 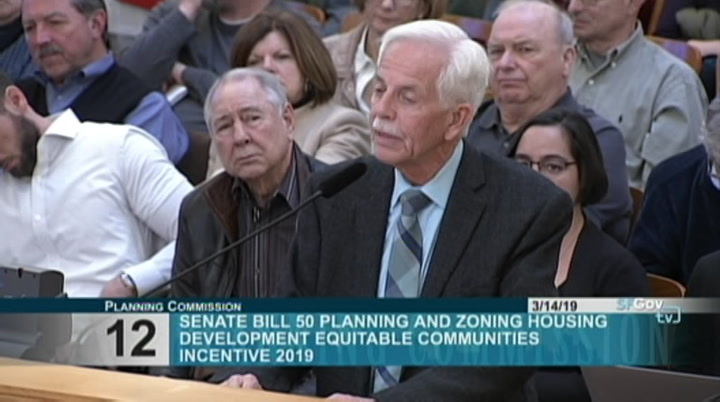 and the legislation allows the project to layer that incentive with a state density bonus and other state laws like sb35. it does not appear to otherwise alter the local municipality process, including design review and controls. 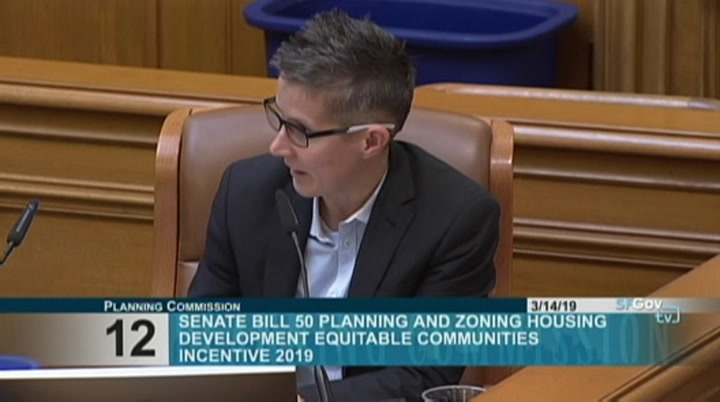 we have several outstanding questions about how our local laws and procedures might interact with sb50 and other state laws, including the housing accountability act. 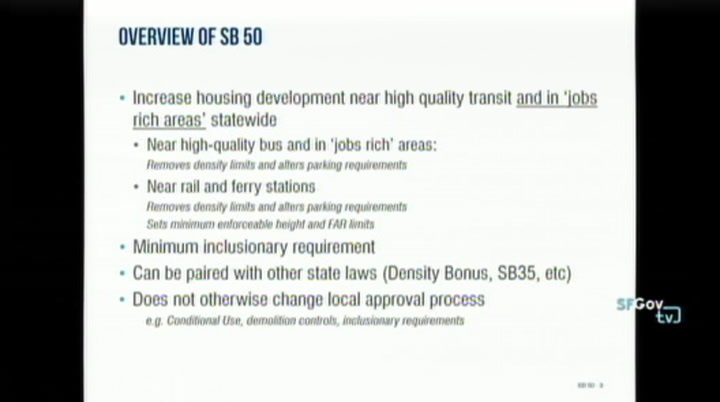 so here's what sb50 proposes. i'll go from bottom to top. 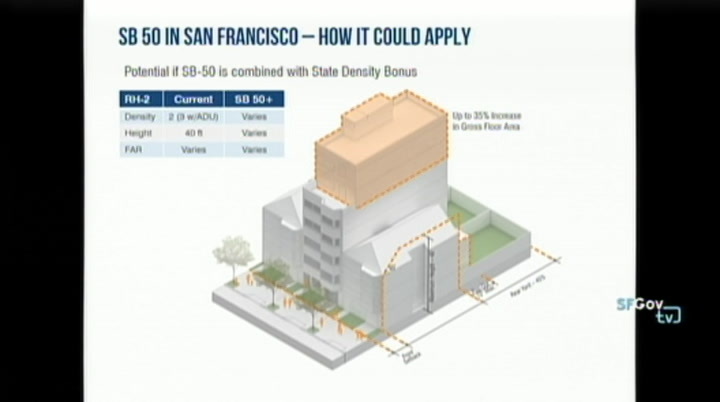 chose a typical lot and then we produced graphics to visualize what we think sb50 might result in. i'm going to give full credit and thanks to alison, who created these on a very short deadline. 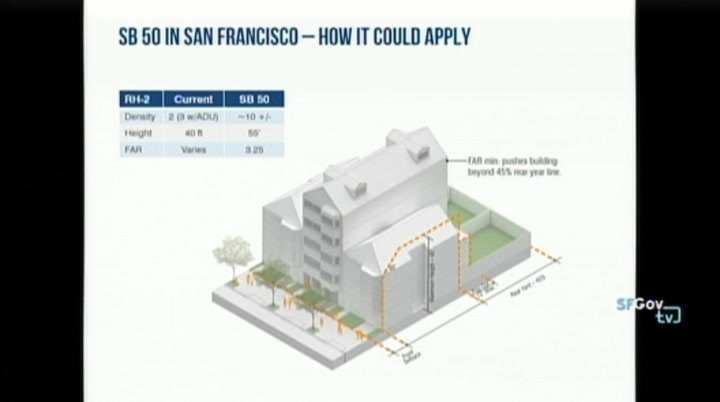 i also note that these drawings, in some cases show what might be technically possible under the proposed bill. and i'll try to add context as to what we think might actually happen. sorry, let me go back. 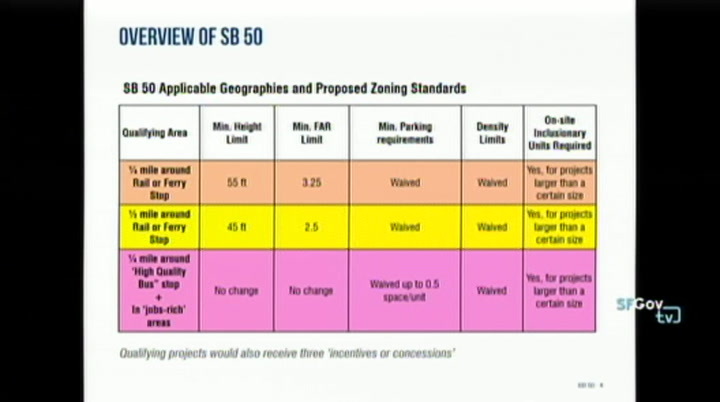 so here we have a typical 25 by 100 lot zoned rh-2. 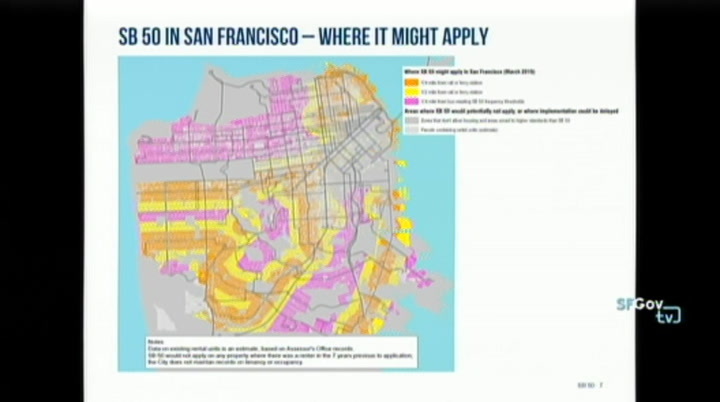 we think the zones where sb50 would lead to the greatest change of zoned capacity. 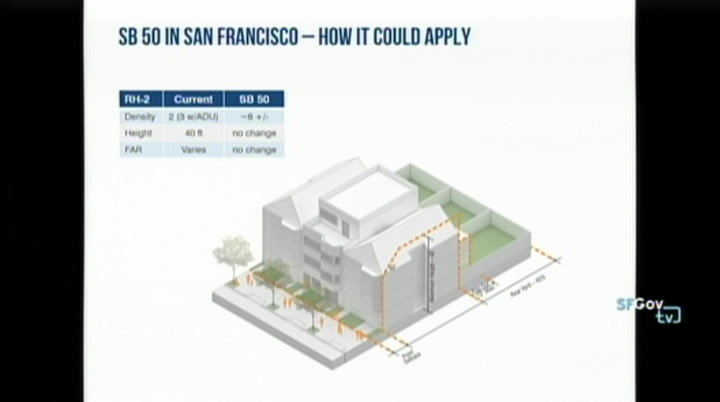 this shows three adjacent lots and this is the typical zoning envelope. 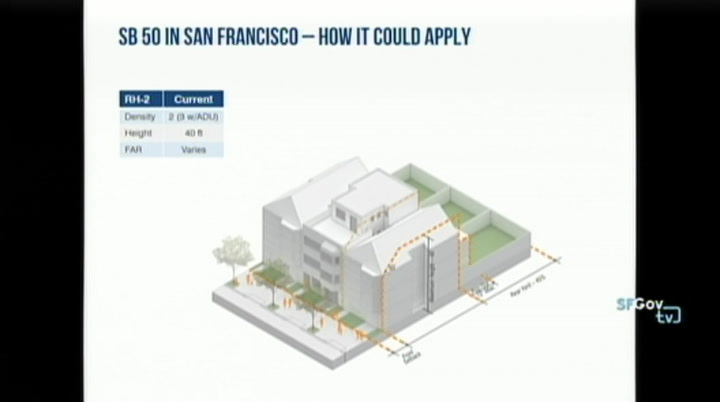 we do not control residential den density by f.a.r. light court on the first floor where you can watch and listen to the proceedings. 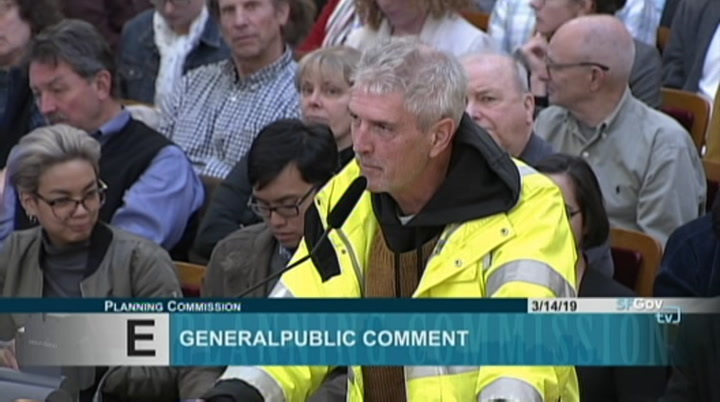 when your name is called for public testimony, you're more than welcome to re-enter the room and submit your testimony. 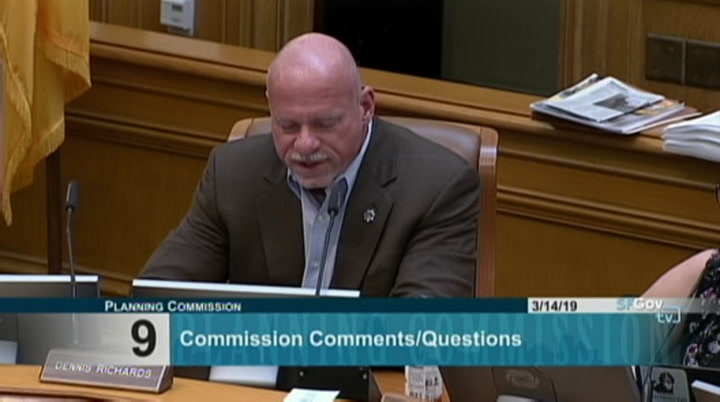 >> president melgar: we'll now take public comment on this item. 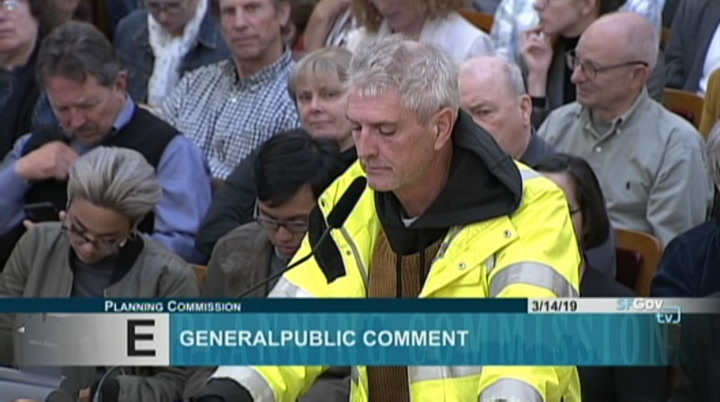 public comment will be two minutes. 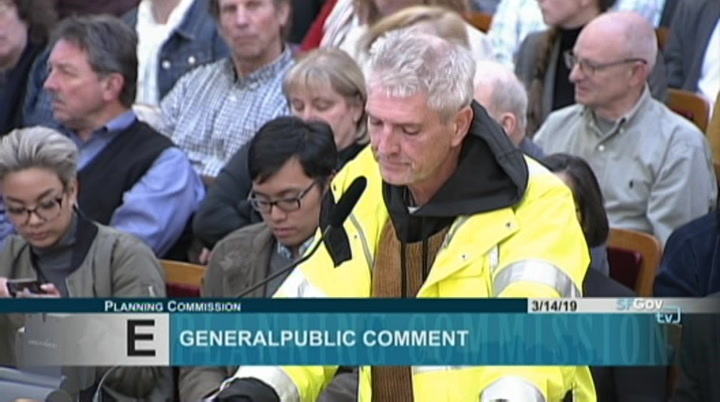 we have many, many public commenters. i'm going to read off a few names. please line up on the left side of the room. that way, you're not blocking the exit. and you can come up in no particular order. i have georgia, david, roger, calvin, jim, caroline, lori, ashley, and christopher. please come up. keep your hands off san francisco. if you want to help, send us funds for affordable housing. i'm here today to stand up for san francisco and i call upon you, our planning commissioners, to oppose sb50 and ask our board of supervisors and our mayor to oppose this destructive bill. 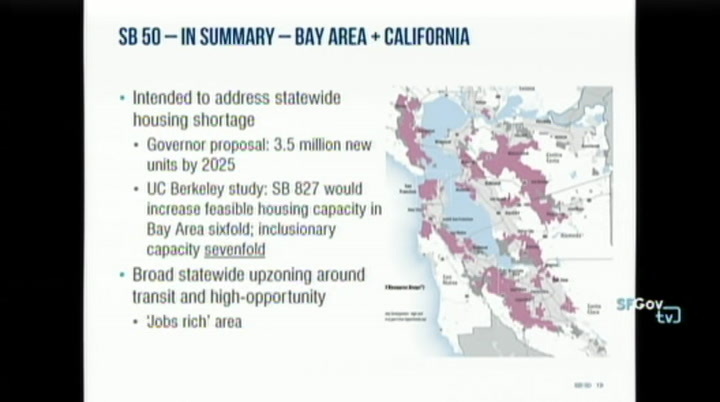 this does not address our housing problem. >> next speaker, please. 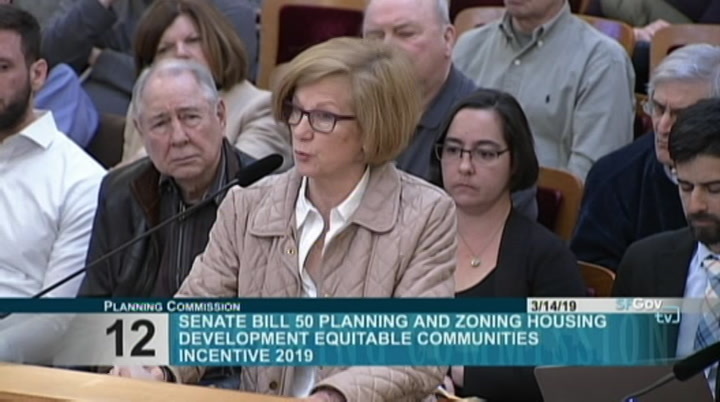 >> i ask myself, what is it that sb50 supporters want and does this bill deliver it? no. the answer is a resounding no. 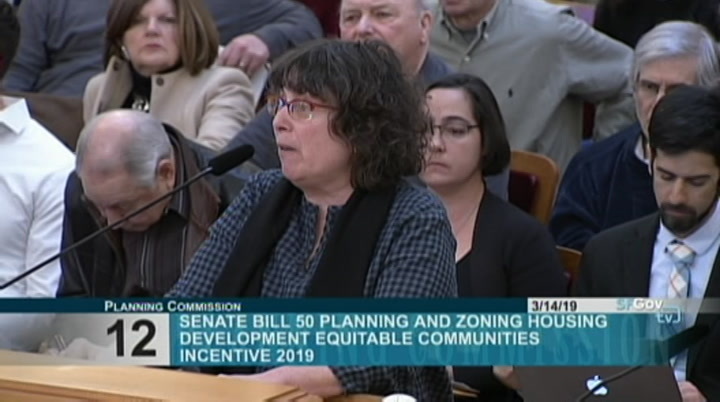 there is a shortage of affordable housing and rentals and i can sympathize with folks who vent their frustration that prices are out of reach. my own children feel the same pain. 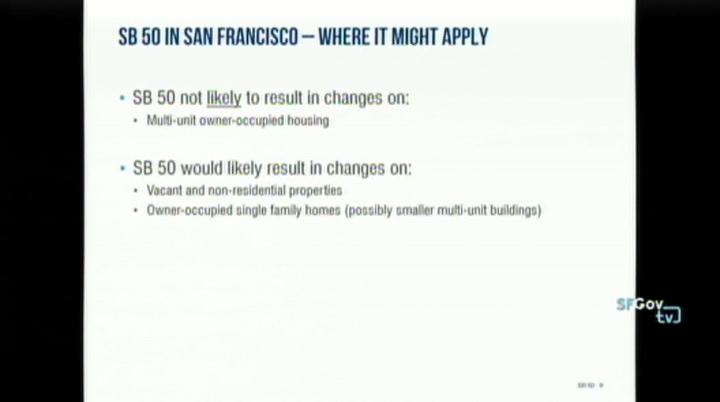 they want affordable housing rather they're low, moderate or higher income levels. 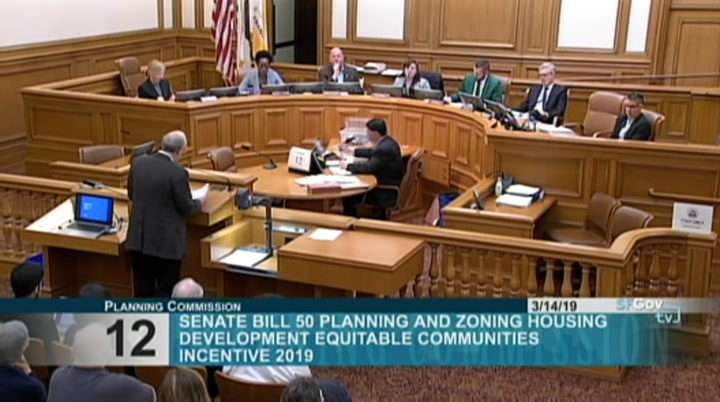 there is a problem, but sb50 is not the solution. 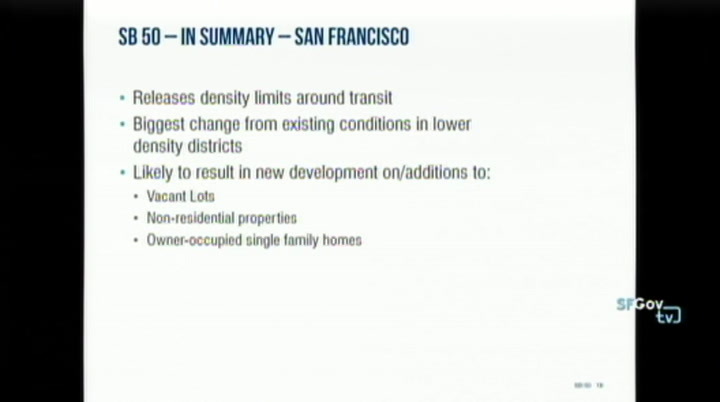 this encourages luxury condos which will only exacerbate housing prices and make them further out of reach. 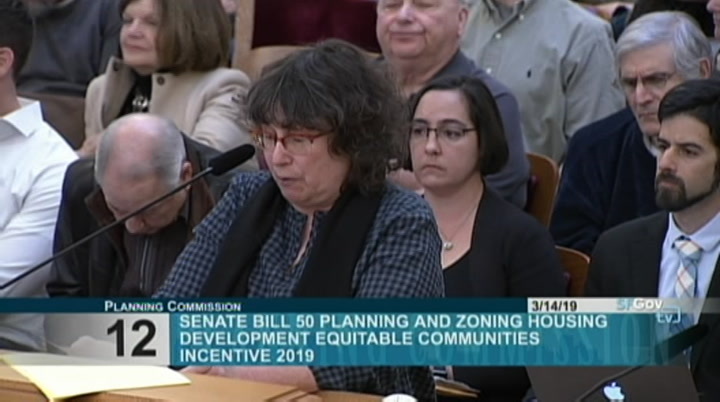 the planning department's analysis -- and thank you for your hard work on that -- is a really good start, but to fully understand the real impact of the bill, we need a deep analysis as you are clearly starting to do on the combined bills when you pull together the state density bonus and the housing accountability act. 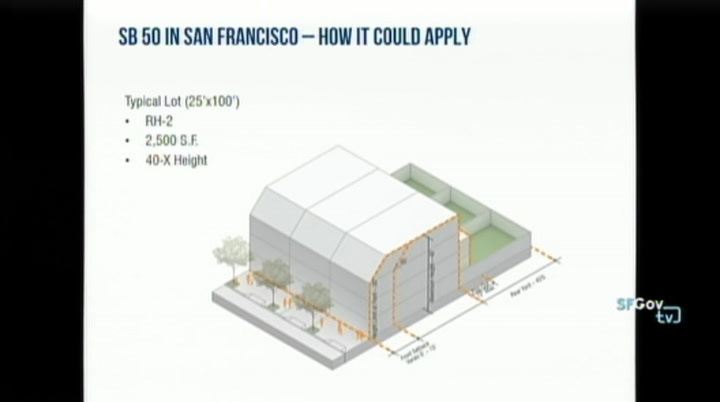 those are the trap doors in sb50. when you read it up front, it looks pretty and 55 feet is as high as we go. and then you see the links to other legislation and you realize it's just the beginning. control. it does not. 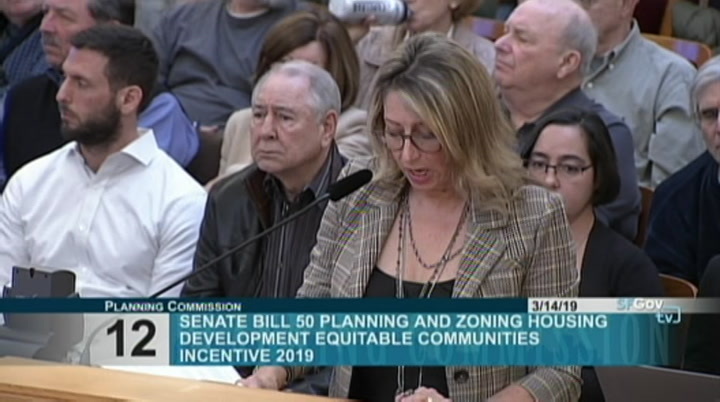 all housing projects will still be under ceqa implemented by our planning department. san francisco's design review remains. san francisco strict demolition control remains. 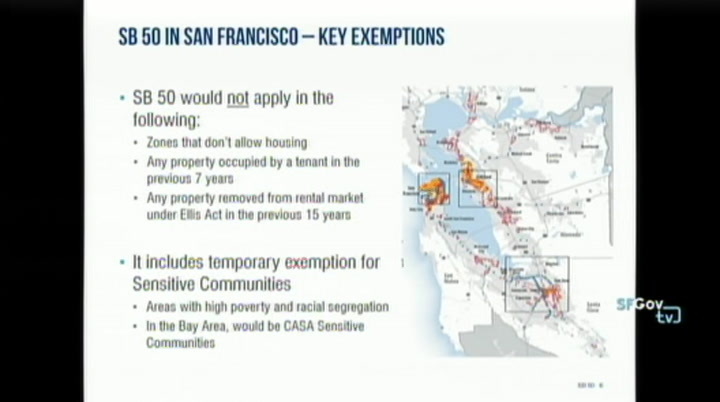 san francisco strict tenant protection remains. 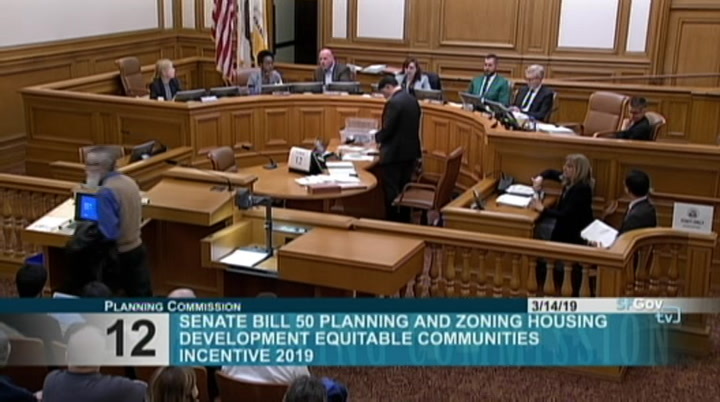 san francisco's high inclusionary housing remains. 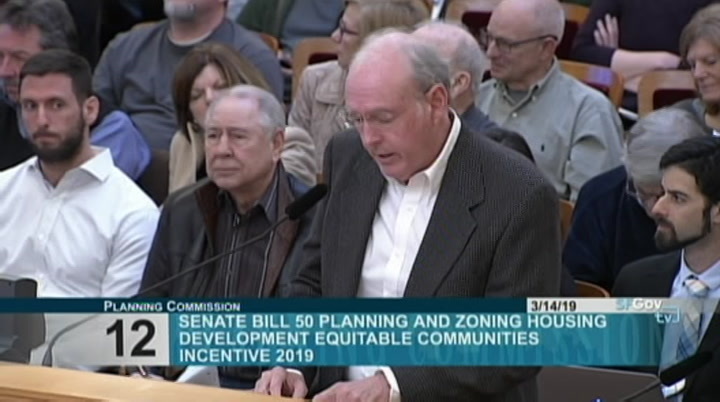 no property owner is forced to sell, give up or develop their land. there is no imminent domain associated with the bill. developers would still be able to develop smaller projects if they choose. 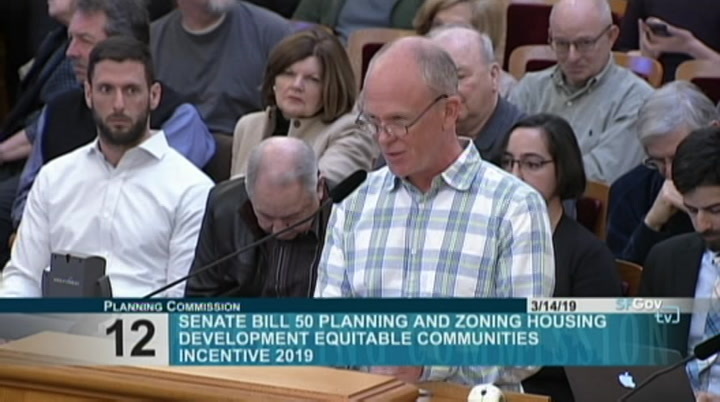 city zoning could simply not be more limiting than the bill. in many ways, it takes us back to how san francisco developed the wonderful diverse mixed neighborhoods we all love before this fear of restrictions were enacted in the 1970s. >> president melgar: thank you. next speaker, please. 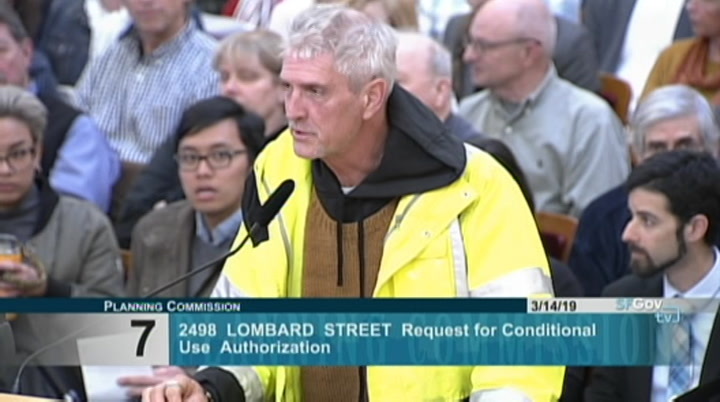 >> thank you, overhead, please. >> president melgar: if you could pull the mic. 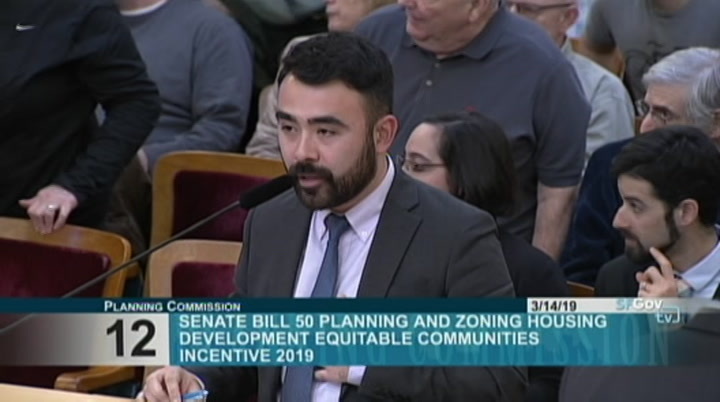 >> i'm speaking today as member of the transportation 2045 task force which issued its report in january of 2018 and it's astounding to me that your staff dhoez -- chose to analyze what is essentially a transit oriented development proposal, sb50, without looking at the transit side. if you look at your committee's -- your staff's report, on page 8, they pretty much demonstrate the point that i'm going to try to make here. 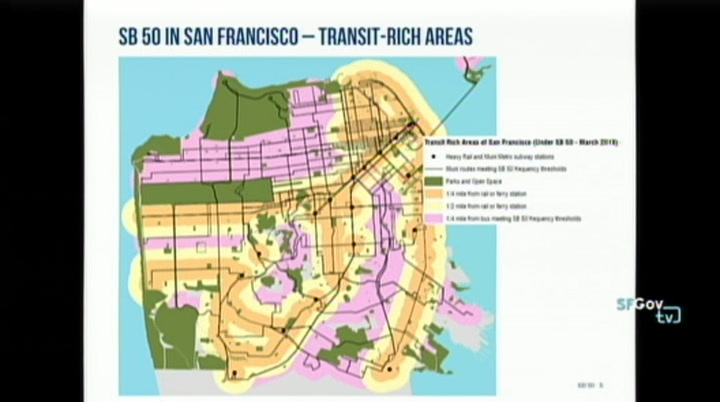 we have an extraordinary transit deficit, not only in san francisco, but in the region. it's about $210 billion. that's a b. that's billion dollars.